Snails (Giant East African Snail) | Infonet Biovision Home. (c) Courtesy EcoPort (http://www.ecoport.org): Yuri Yashin, www.insectimages.org. (c) Courtesy EcoPort (http://www.ecoport.org): FAO. The Giant East African Snail Achatina fulica, is a species of large, air-breathing land snail, a terrestrial pulmonate gastropod mollusc in the family Achatinidae. It is a macrophytophagous herbivore; it eats a wide range of plant material, fruit and vegetables. It will sometimes eat sand, very small stones, bones from carcasses and even concrete as calcium sources for its shell. In rare instances, the snails will consume each other. In captivity as a pet, this species can be fed on grain products such as bread, digestive biscuits and chicken feed. Fruits and vegetables must be washed diligently as the snail is very sensitive to any lingering pesticides. In captivity, snails need cuttlebone to aid the growth and strength for their shells. As with all molluscs, they enjoy the yeast in beer, which serves as a growth stimulus. It is considered to be one of the most damaging land snails in the world. 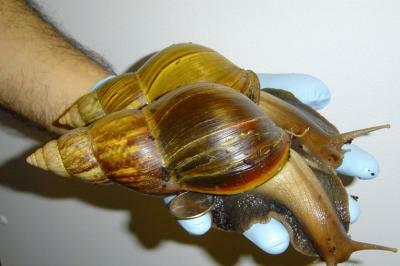 Compared to other snails, this pest is really big about 20 cm long overall with the shell making up half its length. It is also showy, with a light-brown shell striped with brown and cream bands. Two qualities make this tropical snail especially dangerous. First, it can survive cold conditions and even snow by aestivating. This means that the snail will become slow and sluggish, essentially hibernating until warm weather returns. Second, the snail is a whiz at reproduction. Each snail contains both female and male reproductive organs! After a single mating session, each snail can produce a batch of 100 to 400 eggs. And it can keep this up several more times without having to mate again. 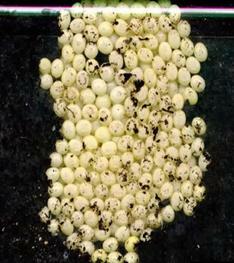 In a typical year, every mated adult lays about 1,200 eggs. It can live as long as 9 years, and that is plenty of time to cause trouble in the local environment. Giant East African Snail is a major agricultural pest, feeding on a variety of crops and causing significant economic losses. In the US state of Florida it has been estimated that Giant East African Snail would have caused an annual loss of $US 11 million in 1969 if its population had not been controlled. In India it attained serious pest status, particularly in 1946/47, when it appeared in epidemic proportions in Orissa and caused severe damage to vegetable crops and rice paddies. 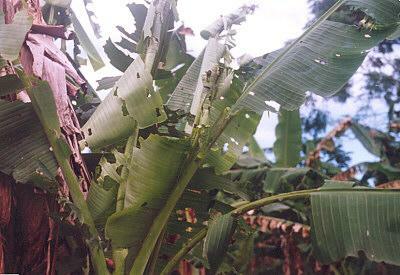 Plants most likely damaged by the snail are garden flowers and ornamentals, vegetables, (especially Cruciferae, Cucurbitaceae and Leguminosae) and immature specimens of breadfruit, cassava and teak wood. Giant East Aftrican Snail may also increase the spread of plant diseases (for example, black pod disease of cocoa caused by Phytophthora palmivora), which it spreads in its faeces. Giant East African Snail is a vector for several pathogens and parasites, including the roundworm responsible for eosinophilic meningo-encephalitis in humans and the bacterium Aeromonas hyfrophila (also found in shellfish in New Zealand). The parasites carried by the snail are usually passed to humans through the consumption of raw or improperly cooked snails.Giant East African Snail is also a general nuisance when found near human habitations and can be hazardous to drivers, causing cars to skid. Their decaying bodies also release a bad stench and the calcium carbonate in their shells neutralises acid soils, altering soil properties and the types of plants that can grow in the soil. Giant East African Snail has a remarkably broad range of host plants on which it feeds. Young snails with shell heights of 5 mm to 3 cm are most predacious on living vegetation, with very small and older individuals preferring detritus and decaying vegetation. The major requirement of hatchlings is calcium until their shell reaches the 5 mm size. Young Giant East African Snail appears to prefer soft textured banana (Musa), bean (Beta vulgaris) and marigold (Tagetes patula). As the snail matures its dietary preferences broaden to include a larger variety of plants, including brinjal (Solanummelongena), cabbage and cauliflower (Brassica oleracea v. capitata and botrytis), lady's finger (Abelmoschus esculentus), sponge gourd (Luffa cylindrica), pumpkin (Cucurbita pepo), papaya (Carica papaya), cucumber (Cucumis sativus) and peas (Pisum sativum). Giant East African Snail has a narrow, conical shell, which is twice as long as it is wide and contains 7 to 9 whorls when fully grown. 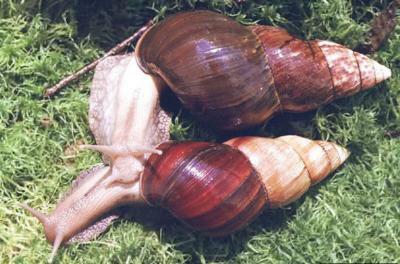 The shell is generally reddish-brown in colour with weak yellowish vertical markings but colouration varies with environmental conditions and diet. A light coffee colour is common. 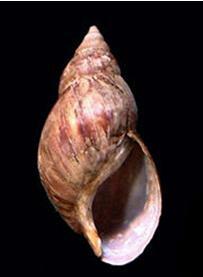 Adults of the species may exceed 20 cm in shell length but generally average about 5 to 10cm. The average weight of the snail is approximately 32 grams. Adult size is reached in about six months, after which growth slows but does not ever cease. Life expectancy is commonly five or six years in captivity, but the snails may live for up to ten years. They are active at night and spend the day buried underground. It is capable of aestivating for up to three years in times of extreme drought, sealing itself into its shell by secretion of a calcerous compound that dries on contact with the air. This is impermeable; the snail will not lose any water during this period. 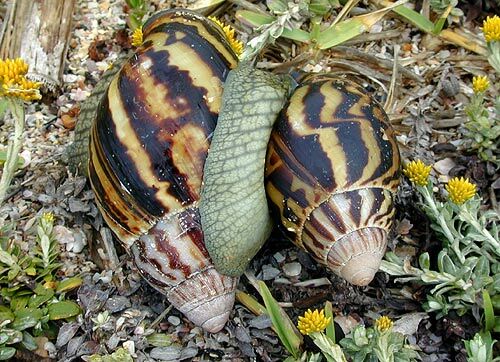 Giant East African Snail is an obligate-outcrossing hermaphrodite, which means that one externally fertilised snail can establish a population A. fulica produces large eggs that are 4.5 to 5.5 mm in diameter and only hatch at temperatures above 15degC. Snails begin laying eggs at six months of age and fecundity lasts approximately 400 days. Snails lay up to 100 eggs in their first year, and up to 500 in their second year; fecundity declines after the second year, but snails may live up to five years with a total egg clutch of up to 1000. Dependent on the temperature, the babies will hatch from 5 to 21 days. Snails mature at around 5 to 15 months, depending on the temperature (with cold winter temperatures inducing hibernation and delaying sexual maturity). Further below you find concrete preventive and curative methods against Snails. Monitor regularly for the pest in the nursery and in the field. In East Africa, sprinkling their habitats and / or around crop base with table salt in dry seasons, has proven effective in their control. Brewers' waste in water containers is effective trap. They are attracted by the yeast and they get drowned when going for the 'brew'. All of the countries in which the Giant East African Snail (Achatina fulica) is established have tropical climates with warm, mild year-round temperatures and high humidity. The species occurs in agricultural areas, coastal areas and wetlands, disturbed areas, natural and planted forests, riparian zones, scrublands and shrublands, and urban areas. These snails thrive in forest edge, modified forest, and plantation habitats. Wherever it occurs, the snail keeps to the hot lowlands and the warm temperate lower slopes of the mountains. It needs temperatures well above freezing year-round, and high humidity at least during part of the year, the drier months being spent in dormant aestivation. It is killed by sunshine. A. fulica remains active at a temperature range of 9degC to 29degC, and survives temperatures of 2degC by hibernation and 30degC by aestivation. The introduction of Giant East African Snail has often led to the purposeful introduction of predatory snails and predatory flatworms as biological control agents. These agents usually have a devastating effect on the environment. For example, a particularly important cause of the demise of the endemic snails in forested habitats in Tahiti and Hawaii has been the deliberate introduction of the predatory snail (Euglandina rosea) and predatory flatworms, such as Platydemus manokwari to control Giant East African Snail. International quarantine and surveillance activities. Hand collection (in some countries they constitute a food source and even exported as a food delicacy to Europe. Also in some European countries snails are kept as pets). Food baits (e.g. over-ripe papaya fruit pieces). However, these baits should be daily removed from orchards and destroyed. Mead, A. R. (1979). Pulmonates Volume 2B. Economic malacology with particular reference to Achatina fulica. London, Academic Press. Mead, A. R. (1961). The giant African snail: a problem in economic malacology. Chicago, University of Chicago Press.